Back to the Future Part II is a 1989 American science fiction adventure comedy film directed by Robert Zemeckis and written by Bob Gale. It is the sequel to the 1985 film Back to the Future and the second installment in the Back to the Future trilogy. The film stars Michael J. Fox, Christopher Lloyd, Thomas F. Wilson, and Lea Thompson and continues immediately following the original film. 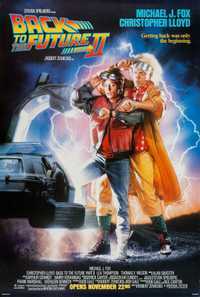 After repairing the damage to history done by his previous time travel adventures, Marty McFly (Fox) and his friend Dr. Emmett "Doc" Brown (Lloyd) travel to 2015 to prevent McFly's future son from ending up imprisoned. However, their presence allows Biff Tannen (Wilson) to steal Doc's DeLorean time machine and travel to 1955, where he alters history by making his younger self wealthy. The film was produced on a $40-million budget and was filmed back-to-back with its sequel, Part III. Filming began in February 1989 after two years were spent building the sets and writing the scripts. Two actors from the first film, Crispin Glover and Claudia Wells, did not return for the final two. While Elisabeth Shue was recast in the role of Wells' character, Jennifer, Glover's character, George McFly, was not only minimized in the plot, but also was obscured and recreated with another actor. Glover successfully sued both Zemeckis and Gale, changing how producers can deal with the departure and replacement of actors in a role. Back to the Future Part II was also a ground-breaking project for effects studio Industrial Light & Magic (ILM): In addition to digital compositing, ILM used the VistaGlide motion control camera system, which allowed an actor to portray multiple characters simultaneously on-screen without sacrificing camera movement. This webpage uses material from the Wikipedia article "Back_to_the_Future_Part_II" and is licensed under the GNU Free Documentation License. Reality TV World is not responsible for any errors or omissions the Wikipedia article may contain.